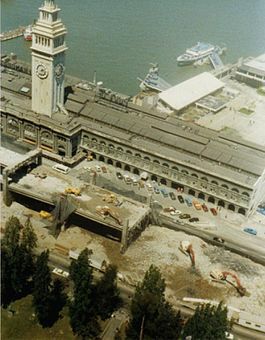 Part of the Embarcadero Freeway in San Francisco being torn down in 1991. The removal of the freeway illustrates the inverse of induced demand, "reduced demand". Induced demand – related to latent demand and generated demand – is the phenomenon that after supply increases, more of a good is consumed. This is entirely consistent with the economic theory of supply and demand; however, this idea has become important in the debate over the expansion of transportation systems, and is often used as an argument against increasing roadway traffic capacity as a cure for congestion. This phenomenon, called induced traffic, is a contributing factor to urban sprawl. City planner Jeff Speck has called induced demand "the great intellectual black hole in city planning, the one professional certainty that everyone thoughtful seems to acknowledge, yet almost no one is willing to act upon." The inverse effect, or reduced demand, is also observed (see below). Induced demand is often used as a catch-all term for a variety of interconnected effects that cause new roads to quickly fill up to capacity. In rapidly growing areas where roads were not designed for the current population, there may be a great deal of latent demand for new road capacity, which causes a flood of new drivers to immediately take to the freeway once the new lanes are open, quickly clogging them up again. But these individuals were presumably already living nearby; how did they get around before the expansion? They may have taken alternative modes of transport, traveled at off hours, or not made those trips at all. That’s why latent demand can be difficult to disentangle from generated demand—the new traffic that is a direct result of the new capacity. (Some researchers try to isolate generated demand as the sole effect of induced demand). The technical distinction between the two terms, which are often used interchageably, is that latent demand is travel that cannot be realized because of constraints. It is thus "pent-up". Induced demand is demand that has been realized, or "generated", by improvements made to transportation infrastructure. Thus, induced demand generates the traffic that had been "pent-up" as latent demand. Latent demand has been recognised by road traffic professionals for many decades, and was initially referred to as "traffic generation". In the simplest terms, latent demand is demand that exists, but, for any number of reasons, most having to do with human psychology, is suppressed by the inability of the system to handle it. Once additional capacity is added to the network, the demand that had been latent materializes as actual usage. During the last two or three years before [the entrance of the United States into World War II], a few planners had...begun to understand that, without a balanced system [of transportation], roads would not only not alleviate transportation congestion but would aggravate it. Watching Moses open the Triborough Bridge to ease congestion on the Queensborough Bridge, open the Bronx-Whitestone Bridge to ease congestion on the Triborough Bridge and then watching traffic counts on all three bridges mount until all three were as congested as one had been before, planners could hardly avoid the conclusion that "traffic generation" was no longer a theory but a proven fact: the more highways were built to alleviate congestion, the more automobiles would pour into them and congest them and this force the building of more highways – which would generate more traffic and become congested in their turn in an ever-widening spiral that contained the most awesome implications for the future of New York and of all urban areas. ...every time a new parkway was built, it quickly became jammed with traffic, but the load on the old parkways was not significantly relieved. Motorways and bypasses generate traffic, that is, produce extra traffic, partly by inducing people to travel who would not otherwise have done so by making the new route more convenient than the old, partly by people who go out of their direct route to enjoy the greater convenience of the new road, and partly by people who use the towns bypassed because they are more convenient for shopping and visits when through traffic has been removed. ...on average, a 10 percent increase in lane miles induces an immediate 4 percent increase in vehicle miles traveled, which climbs to 10 percent – the entire new capacity – in a few years. An aphorism among some traffic engineers is "Trying to cure traffic congestion by adding more capacity is like trying to cure obesity by loosening your belt." According to city planner Jeff Speck, the "seminal" text on induced demand is the 1993 book The Elephant in the Bedroom: Automobile Dependence and Denial, written by Stanley I. Hart and Alvin L. Spivak. A journey on a road can be considered as having an associated cost or price (the generalised cost, g) which includes the out-of-pocket cost (e.g. fuel costs and tolls) and the opportunity cost of the time spent travelling, which is usually calculated as the product of travel time and the value of travellers' time. When road capacity is increased, initially there is more road space per vehicle travelling than there was before, so congestion is reduced, and therefore the time spent travelling is reduced – reducing the generalised cost of every journey (by affecting the second "cost" mentioned in the previous paragraph). In fact, this is one of the key justifications for construction of new road capacity (the reduction in journey times). A change in the cost (or price) of travel results in a change in the quantity consumed. This can be explained using the simple supply and demand theory, illustrated below. For roads or highways, the supply relates to capacity and the quantity consumed refers to vehicle-kilometres travelled. The size of the increase in quantity consumed depends on the elasticity of demand. A review of transport research suggests that the elasticity of traffic demand with respect to travel time is around −0.5 in the short term and −1.0 in the long term. This indicates that a 1.0% saving in travel time will generate an additional 0.5% increase in traffic within the first year. In the longer term, a 1.0% saving in travel time will result in a 1.0% increase in traffic volume. In the short term, increased travel on new road space can come from one of two sources: diverted travel and induced traffic. Diverted travel occurs when people divert their trip from another road (change in route) or retime their travel (change in timing). For example, people might travel to work earlier than they would otherwise like, in order to avoid peak period congestion – but if road capacity is expanded, peak congestion is lower and they can travel at the time they prefer. Induced traffic occurs when new automobile trips are generated. This can occur when people choose to travel by car instead of public transport, or decide to travel when they otherwise would not have. Shortening travel times can also encourage longer trips as reduced travel costs encourage people to choose farther destinations. Although this may not increase the number of trips, it increases vehicle-kilometres travelled. In the long term, this effect alters land use patterns as people choose homes and workplace locations farther away than they would have without the expanded road capacity. These development patterns encourage automobile dependency which contributes to the high long-term demand elasticities of road expansion. Although planners take into account future traffic growth when planning new roads (this often being an apparently reasonable justification for new roads in itself – that traffic growth will mean more road capacity is required), this traffic growth is calculated from increases in car ownership and economic activity, and does not take into account traffic induced by the presence of the new road; that is, it is assumed that traffic will grow, regardless of whether a road is built or not. In the UK, the idea of induced traffic was used as a grounds for protests against government policy of road construction in the 1970s, 1980s and early 1990s, until it became accepted as a given by the government as a result of their own Standing Advisory Committee on Trunk Road Assessment (SACTRA) study of 1994. However, despite the concept of induced traffic now being accepted, it is not always taken into consideration in planning. A 1998 meta-analysis by the Surface Transportation Policy Project, which utilized data from the Institute, stated that "Metro areas which invested heavily in road capacity expansion fared no better in easing congestion than metro areas that did not." A comparison of congestion data from 1982 to 2011 by the Texas A&M Transportation Institute suggested that additional roadways reduced the rate of congestion increase. When increases in road capacity were matched to the increase demand, growth in congestion was found to be lower. On the other hand, one study by Robert Cervero, a professor of City and Regional Planning at the University of California, Berkeley, found that "over a six- to eight-year period following freeway expansion, around twenty percent of added capacity is 'preserved,' and around eighty percent gets absorbed or depleted. Half of this absorption is due to external factors, like growing population and income. The other half is due to induced-demand effects, mostly higher speeds but also increased building activities. These represent California experiences from 1980 to 1994. Whether they hold true elsewhere is of course unknown." Vending machines are another example of induced demand. As more items of a certain product are available in the vending machine, consumers are more likely to acquire them. Just as increasing road capacity reduces the cost of travel and thus increases demand, the reverse is also observed – decreasing road capacity increases the cost of travel, so demand is reduced. This observation, for which there is much empirical evidence, has been called disappearing traffic, also traffic evaporation or traffic suppression, or, more generally, dissuaded demand. So the closure of a road or reduction in its capacity (e.g. reducing the number of available lanes) will result in the adjustment of traveler behavior to compensate – for example, people might stop making particular trips, condense multiple trips into one, re-time their trips to a less congested time, or switch to public transport, carpooling, walking, bicycling or smaller motor vehicles less affected by road diets, such as motorcycles, depending upon the values of those trips or of the schedule delay they experience. In 1994, the UK advisory committee SACTRA carried out a major review of the effect of increasing road capacity, and reported that the evidence suggested such increases often resulted in substantial increases in the volume of traffic. Following this, London Transport and the Department of the Environment, Transport and the Regions commissioned a study to see if the reverse also occurred, namely that when road capacity was reduced, there would be a reduction in traffic. This follow-up study was carried out by Sally Cairns, Carmen Hass-Klau and Phil Goodwin, with an Annex by Ryuichi Kitamura, Toshiyuki Yamamoto and Satoshi Fujii, and published as a book in 1998. A third study was carried out by Sally Cairns, Steve Atkins and Phil Goodwin, and published in the journal Municipal Engineer in 2002. The 1998 study referred to about 150 sources of evidence, of which the most important were about 60 case studies in the UK, Germany, Austria, Switzerland, Italy, The Netherlands, Sweden, Norway, the US, Canada, Tasmania and Japan. They included major town centre traffic schemes to make pedestrian areas closed to traffic, bus priority measures (especially bus lanes), bridge and road closures for maintenance, and closures due to natural disasters, mostly earthquakes. The 2002 study added some extra case studies, including some involving cycle lanes. The Annex by Kitamura and his colleagues reported a detailed study of the effects of the Hanshin-Awaji earthquake in Japan. Taking the results as a whole, there was an average reduction of 41% of the traffic flows on the roads whose capacity had been reduced, of which rather less than half could be detected as reappearing on alternative routes. Thus, on average, about 25% of the traffic disappeared. Analysis of surveys and traffic counts indicated that the disappearance was accounted for by between 15 and 20 different behavioural responses, including changing to other modes of transport, changing to other destinations, a reduction in the frequency of trips, and car-sharing. There was a large variation around these average results, with the biggest effects seen in large-scale pedestrianisation in German town centres, and the smallest seen in small-scale temporary closures with good alternative routes, and small reductions in capacity in uncongested streets. In a few cases, there was actually an increase in the volume of traffic, notably in towns which had closed some town centre roads at the same time as opening a new by-pass. ...the findings reinforce the overall conclusion of the original study—namely, that well-designed and well-implemented schemes to reallocate roadspace away from general traffic can help to improve conditions for pedestrians, cyclists or public transport users, without significantly increasing congestion or other related problems. The European Union have produced a manual titled "Reclaiming city streets for people" that presents case studies and methodologies for traffic evaporation in urban areas. An early example of the reduced demand effect was described by Jane Jacobs in her classic 1961 book The Death and Life of Great American Cities. Jacobs and others convinced New York City to close the street that split Greenwich Village's Washington Square Park in two, and also not to widen the surrounding streets to service the extra capacity they were expected to carry because of the closing of the street. The city's traffic engineers expected the result to be chaos, but, in fact, the extra traffic never appeared, as drivers instead avoided the area entirely. Two widely known examples of reduced demand occurred in San Francisco, California and in Manhattan, New York City, where, respectively, the Embarcadero Freeway and the lower portion of the elevated West Side Highway were torn down after sections of them collapsed. Concerns were expressed that the traffic which had used these highways would overwhelm local streets, but, in fact, the traffic, instead of being displaced, for the most part disappeared entirely. A New York State Department of Transportation study showed that 93% of the traffic which had used the West Side Highway was not displaced, but simply vanished. After these examples, other highways, including portions of Harbor Drive in Portland, Oregon, the Park East Freeway in Milwaukee, Wisconsin, the Central Freeway in San Francisco, and the Cheonggyecheon Freeway in Seoul, South Korea were torn down, with the same effect observed. The argument is also made to convert roads previously open to vehicular traffic into pedestrian areas, with a positive impact on the environment and congestion, as in the example of the central area of Florence, Italy. In New York City, after Mayor Michael Bloomberg's plan for congestion pricing in Manhattan was rejected by the New York State Assembly, portions of Broadway at Times Square, Herald Square and Madison Square were converted into pedestrian plazas, and traffic lanes in other areas taken out of service in favor of protected bike lanes, reducing the convenience of using Broadway as a through-route. As a result, traffic on Broadway was reduced, and the speed of traffic in the area lessened. Another measure instituted was the replacement of through-lanes on some of Manhattan's north-south avenues with dedicated left-turn lanes and protected bike lanes, reducing the avenues' carrying capacity. The Bloomberg administration was able to put these changes into effect as they did not require approval from the state legislature. Despite the success of the Broadway pedestrian plazas in Manhattan, in general, pedestrian malls, in which all traffic is removed from shopping streets, have not been successful, leading to the conclusion that only particular areas – such as in college towns and resorts, which already have sufficient population density or pedestrian traffic – can successfully pursue this path. Of the approximately 200 pedestrian malls created from the 1970s on, only about 30 remained as of 2012, and many of these were in poorer areas of their cities. The exceptions, including the Third Street Promenade in Santa Monica, California and 16th Street in Denver, Colorado, are indicators that conversion of shopping streets to pedestrian malls can be successful, although the proper preconditions must exist. Some of the failed pedestrian malls have improved by allowing limited automobile traffic to return. As with automobile traffic, reducing public transit services will reduce to some extent the use of those facilities, where trips again may be abandoned or switched to private transport. ^ Leeming, J. J. (1969). Road Accidents: Prevent or Punish?. Cassell. ISBN 0304932132. ^ Goodwin, P. B. (1996). "Empirical evidence on induced traffic: A review and synthesis". Transportation. 23: 35–54. doi:10.1007/BF00166218. ^ a b c Litman, T. L. (2011). "Generated Traffic and Induced Travel: Implications for Transport Planning" (PDF). ^ a b Wood, Derek & Standing Advisory Committee on Trunk Road Assessment (1994). Trunk Roads and the Generation of Traffic (PDF). London: HMSO. p. 242. ISBN 0-11-551613-1. ^ Texas A&M Transportation Institute. "2012 Urban Mobility Report". Retrieved May 14, 2013. ^ Cervero, Robert (Spring 2003). "Are Induced-Travel Studies Inducing Bad Investments?" (PDF). University of California Transportation Center. Retrieved April 5, 2017. ^ Phillips, Robert Lewis (2005-08-05). Pricing and Revenue Optimization. Stanford University Press. p. 48. ISBN 9780804746984. ^ Aydinliyim, Tolga; Pangburn, Michael S.; Rabinovich, Elliot (2015-07-07). "Online Inventory Disclosure: The Impact of How Consumers Perceive Information". Rochester, New York. ^ Cairns, Sally; Hass-Klau, Carmen & Goodwin, Phil (1998). Traffic Impact of Highway Capacity Reductions: Assessment of the Evidence. London: Landor Publishing. p. 261. ISBN 1-899650-10-5. ^ a b Cairns, Sally; Atkins, Stephen & Goodwin, Phil (2002). "Disappearing traffic? The story so far". Municipal Engineer. 151 (1): 13–22. Hart, Stanley I. and Spivak, Alvin L (1993). The Elephant in the Bedroom: Automobile Dependence and Denial; Impacts on the Economy and Environment. Pasadena, California: New Paradigm Books. ISBN 0932727646. Todd Litman (2001), “Generated Traffic; Implications for Transport Planning,” ITE Journal, Vol. 71, No. 4, Institute of Transportation Engineers (www.ite.org), April, 2001, pp. 38–47.